The topsy-turvy passage through the Doldrums for the Volvo Ocean Race fleet may have come to an end. Under some pressure – maybe internal – it has been made plain that SKH Scallywag wants to put in a top performance on this leg after a lack lustre race to date. “It will be pretty catastrophic for us if we finish last in this leg”, said skipper David Witt in the Day 9 video from the vicinity of the Equator. While they have been the tail-end Charlie for much of the leg, through the Doldrums, they have got a sniff of the lead and had certainly played catch-up. A day ago they could see the front runners on the water, which made a pleasant from being only able to spot their competitors on the computer screen. But even with an on the water target to chase, Witt and his crew once again got dealt a bad hand and slipped back. 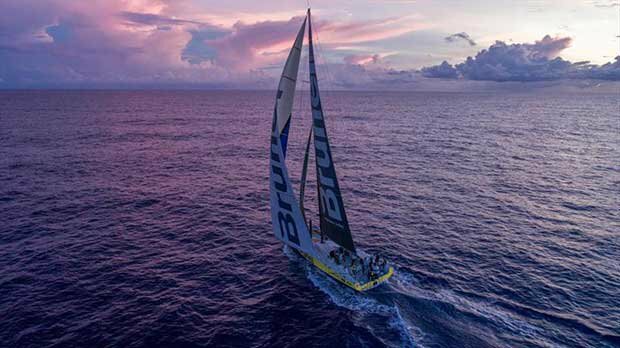 18 hours ago it looked as if the leaders had escaped the Doldrums and kept sailing at double-digit speeds to the north without making any westing to the finish in Hong Kong. Then they ran out of breeze again. At the back of the fleet, and with not too many options Witt clearly decided that fortune favours the brave and made a break to the west. The move appears so far to have paid off. 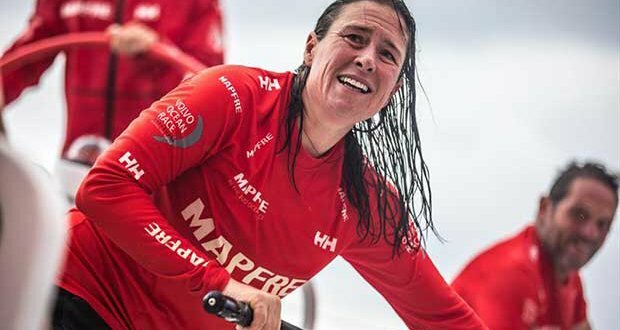 The Hong Kong entry has been joined by the overall leader MAPFRE and Turn the Tide on Plastic, which like SHK Scallywag has been frequenting the tail end of the leaderboard. The three boats are now heading for Hong Kong, while the other four are to the north, and would now seem to have decided to opt for a westerly course, with Team Brunel being the last to do so. The Dutch entry, one of two in the race was still heading north at the 0700UTC report on January 12. The weather routing function of Predictwind seems to back up SHK Scallywag’s strategy. At the 0700UTC sked, using the routing function to calculate times to finish the leg based on five weather feeds used by Predictwind, Scallywag had the fastest time. On that basis, she would win the leg. Re-running the positions from the 0942UTC, almost three hours later Scallywag still enjoyed an advantage albeit reduced. The telling factor will be the windstrength – and its consistency. The fleet now spread over a sizeable piece of the ocean it is relatively simple for one to get a better breeze and roll for a few hours at speeds in the double digits and make a substantial gain. The next day will be crucial. The wind and course recommendations for SHK Scallywag show that she will not be in quite the same breeze as MAPFRE and Turn the Tide on Plastic (who are side by side within half a mile of each other). Scallywag is forecast to have a 10kt breeze which the other two have 12kts, but in 12 hours Scallywag will be into the Trades with a 16kt breeze pushing her along at 20kts. In the final day of the leg, only one of the feeds sees the breeze becoming lighter. The others all see it holding at around 20kts with the racers hitting 22kts at the finish.